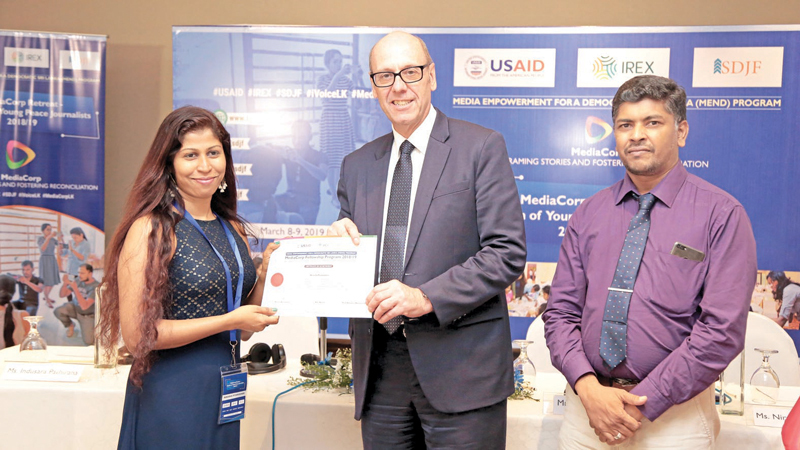 Lanka Development Journalist Forum (SDJF) conducted final awarding and reunion of Young Peace Journalists who took part in the MediaCorp Fellowship Programme recently at Hotel Galadari, Colombo. This event was organized as part of a two days retreat organized by SDJF inits first phase of MediaCorp Fellowship, which is a part of the Media Empowerment for a Democratic Sri Lanka (MEND) Program, implemented by the International Research and Exchanges Board (IREX) with the support from USAID. USAID Mission Director Reed J. Aeschliman attended the final awarding and the retreat as special invitee. Read noted that fellowship program has done much more than just bringing young journalists together in promoting collaborative stories and using media to foster dialogue. He observed that the fellowship program has reflected the shared democratic values and helped journalists to think beyond their own community and identity. Addressing the audience Prof. Padmasiri Wanigadundera, Chairperson, SDJF pointed out that this program has given a hands-on experience for the MediaCorp Fellows to critically look at cultural barriers and enhance their capability to produce conflict, gender and culturally sensitive stories. Four MediaCorp fellows were given the opportunity to share their learning, experience and most significant changes through this fellowship program. They shared their own changes as well as the changes experienced by their colleagues through this program. 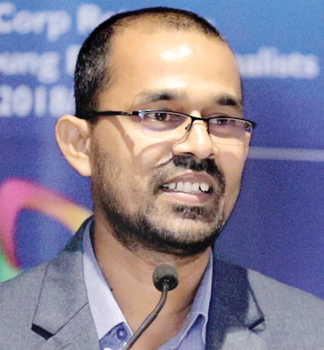 Twenty nine young journalists (16 girls and 13 boys) belonging to different ethnic and linguistic backgrounds (Sinhala-17, Tamil-8 and Muslim 4) from the first batch of MediaCorp Fellowship programme, took part in this event. Alena J. Tansey, Acting Director, Office of Governance and Vulnerable Populations/ Mission Disaster Response Officer, USAID Sri Lanka and Maldives, Shirani Narayana, Governance and Rule of Law Advisor, USAID Sri Lanka, Patrick Mahony, Chief of Party, SCORE, Dr. Dayani Panagoda, Senior Technical Specialist, SCORE, Avanthi Kottegoda, SCORE, Aaranya Rajasingam, Project Coordinator-Policy from GIZ, Senthil Nathan, Chief Operating Officer, Express Newspapers Ceylon Limited and Lasantha Ruhunuge, Sub editor, Anidda newspaper graced this event. At the end of the event MediaCorp fellows had an opportunity to interact with the USAID Mission Director and share their experiences and get mentorship from senior journalists and media managers.